A long wave trough moving across eastern Europe while its southern flank cuts off over southern Balkans and moves into SE Mediterranean while gradually weakening. A strong zonal flow is established across the W-CNTRL Europe with a ridge building towards the central Europe from the SW.
A MDT risk has been issued for parts of Ionian sea and S Greece with Crete with threat for torrential and excessive rainfall, severe winds and some hail / tornado / waterspout threat. 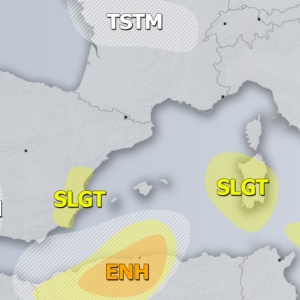 A SLGT risk has been issued for SE Adriatic sea, parts of Greece and Ionian sea into S Mediterranean with threat for waterspouts, heavy excessive rain, strong to severe winds and some marginal hail threat. A SLGT+ risk has been issued for coastal S France into parts of W Mediterranean and Sardinia with threat for severe non-convective wind gusts. A SLGT risk has been issued for NW Alps with threat for excessive rainfall. A WNTR risk has been issued for higher elevations of NW Alps with threat for excessive snowfall. Some enhanced severe wind / heavy rain threat is also within TSTM+ area north of UK but limited coverage to warrant a SLGT risk.